Its dataset was created in a systematized and methodical manner using precision data capture protocols. The dataset is updated daily. The strict application of data capture and upload protocols to each uploaded document makes the TradeLawGuide dataset superior in its level of detail, reliability and consistency across subject matter. Its software links together related information and concepts and presents them contextually. TradeLawGuide creates thousands of relationships between information and concepts and presents them contextually. The context of subject matter is displayed along with related subject matter in other contexts. This drastically improves your understanding of the subject matter and the comprehensiveness of your research. Its tools allow you to research the dataset methodically, systematically and comprehensively. No matter where you start your research (e.g., by subject matter, by provision, by paragraph or footnote in a specific case (report, award or decision)), TradeLawGuide's' research tools enable you to methodically and systematically follow the "thread" of the subject matter through the various sources of WTO law. Worldtradelaw.net and WTO.org present research information in an ad hoc manner. Some material is covered in detail while other material is covered at a lower level of detail or not covered. Neither site captures, organizes and accesses information methodically, systematically or contextually. The strength of Worldtradelaw.net is its case commentaries. The strength of wto.org is that it is the official site of the World Trade Organization and its content covers all aspects of the organization. TradeLawGuide is the only database that enables the user to note up WTO law. "Noting up" or "shepardizing" in the domestic law context refers to examining the judicial treatment of legislation or a case. It is a crucial step in legal research. It must be accomplished methodically and comprehensively. Recent statements by the Appellate Body in US – Stainless Steel (Mexico) and other reports call attention to the importance noting up WTO jurisprudence. The Appellate Body has stated, inter alia, that "following the Appellate Body's' conclusions in earlier disputes is not only appropriate, but is what would be expected from panels, especially where the issues are the same”. Noting up allows the user to: (i) find all jurisprudence that applies or interprets a legal instrument or provision; (ii) determine whether that jurisprudence is still good law, and (iii) determine what adjudicators have been saying about that jurisprudence. This last step is invaluable for understanding the interpretation of the jurisprudence and can lead to jurisprudence that has applied the law to similar facts. The Article Citator notes up the provisions of 72 WTO agreements and instruments and other relevant treaties. The user selects a provision and can instantly find all of the jurisprudence on point, sort and display that jurisprudence to expedite his/her review, and immediately view the specific provision references within that jurisprudence. It captures all references to a provision (e.g., Article 3.1, paragraph 1 of Article 3, Article 3, paragraph 1, etc.). The Jurisprudence Citator notes up the paragraphs and footnotes of all WTO jurisprudence. A paragraph or footnote of a WTO report, award or decision can be selected and then all jurisprudence that cites that paragraph or footnote can be identified immediately and reviewed. The Dispute Settlement Body (DSB) Minutes tool enables the user to quickly note up WTO jurisprudence to ascertain strengths, weaknesses, policy issues or concerns raised in submissions before the DSB. Noting up with TradeLawGuide’s Citators and DSB minutes tool improves the comprehensiveness of research and reduces the risk of errors or oversights. To enable efficient browsing of the thousands of links between related information, TradeLawGuide provides comprehensive pinpoint referencing to all content. This means that the exact paragraphs or footnotes of the documents you are browsing are displayed. 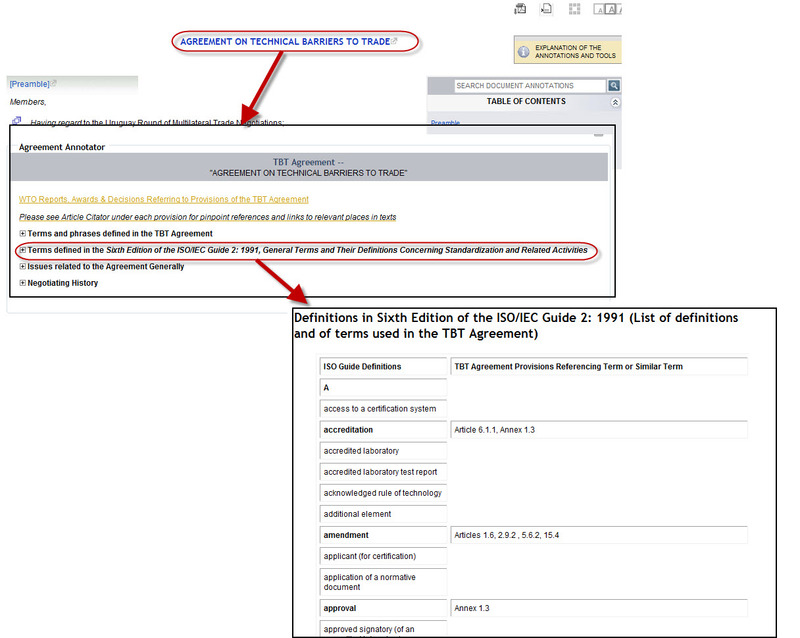 Comprehensive pinpoint referencing is not available in worldtradelaw.net or wto.org. TradeLawGuide.com has a Learning Centre that explains how to methodically research WTO law and that provides detailed instructions on how to use its research tools. Instructional videos and manuals are provided. “TradeLawGuide is a unique database that facilitates fast, comprehensive and methodical research procedures… on a trial basis, research time was reduced to one-third compared with other sources, and the information found was more to the point of what was required.” TradeLawGuide reduces the cost of researching WTO law allowing you to get more out of existing budgetary resources. TradeLawGuide's' unique features are invaluable during "meetings" (i.e., hearings) with WTO panels and the Appellate Body. It is particularly helpful when appearing before the Appellate Body because questions must be answered orally during the course of the meeting. The following examples are publicly available questions that were posed by WTO panels.